Oh yes, the famous pick salami! This is the other Hungaricum, second only to „Túró Rudi – Dots”, that you have to taste when you visit Hungary. And I’m sure that you will buy some salami last in the airport shop, when you leave Hungary. Why, am I so sure of this? Because I have never met anyone (foreign or Hungarian) who could resist this delicious Hungarian food. If you have already visited our Hungaricums page, you probably read that I have spent couple of years abroad, so I have some experience with people who have tasted Pick Salami, thanks to us. Just let me give you an example. During our stay in Finland, we visited our family in Hungary many times and we always took some salami back with us. Once my wife brought a big, whole salami to her colleagues as a present. You cannot imagine how much rejoicing there was when they received and tasted this original Hungaricum. If I remember well, this was the biggest salami that we were able to buy. It means that it was around 80cm (31.5”) long, and the salami was eaten already within one day (she had just 4 or 5 colleagues). I was also very surprised about the success of this present, because I was a little bit skeptical when we bought it, as I didn’t know what the reaction of those people would be, since they had never tasted Pick salami before. They liked it so much, that when we went home the next time they asked my wife to bring Hungarian Salami again! If you are interested in the story of Pick salami and how it is made, please read through this section. But if you are not, just jump over this part and you will see where you can buy this masterful Pick Salami and some tips on how to make salami sandwiches. Mark Pick founded his factory in 1869 in Szeged, which he developed and enlarged. He began to produce salami in a larger amount, with workers coming from Italy in 1883. He began salami making on a large-scale in 1885. After the death of the founder (1892) his widow and her brother led the factory. They transferred the salami factory to Felsõ Tisza-part. The always-cool Tisza-air assured favorable climatic circumstances for the maturing process. The world famous Hungarian salami: made of pork meat and pork lard on the basis of a centuries-old producing tradition. It is made with secret spices, cold smoking, a dry ripening process, in filled casing. It has a special noble-mould on the surface. Pick salami is made in the city of Szeged, which is situated on the bank of river Tisza, as you can see on the map. The natural basis of the counties on the Great Plain, in South Hungary, surrounding Szeged (Baranya, Bács-Kiskun, Csongrád, Békés, Hajdú-Bihar), are very favorable for the cultivation of plants and animal husbandry. This good geographic situation and knowledge related to this makes it possible to improve the husbandry of typical salami pork. From this area comes ripe pork, which has great weight, and which can be used for salami production. The main phases of the salami making process are: preparation of living animal, slaughtering, selection of half pork by quality, cooling, boning, cutting of pork meat and pork lard, seasoning, filling the casings, smoking, drying, maturing, building of mould, packaging. The local conditions give the Pick Salami the very special features, a harmonious smell, typical aroma and unique flavor. The special base material, the traditional technology of salami production, the climatic conditions along river Tisza, the local existence of the mould flora, the saved professional knowledge—passed down from salami master to salami master—contribute to the conquest of the world by Pick salami. You can purchase original Pick Salami (made in Hungary, Szeged) here via our site. If you leave in US this is a very good oportunity to try out this unforgettable salami. Other possibility buying Pick Salami is during a visit to Hungary. You will find this famous salami in every big shopping center or at small butcher shops. But the best thing I can recommend to you is that you visit Szeged and the factory shop. • …you can see the Salami production in the Salami and Paprika museum and you can get salami directly from the factory at the best price. 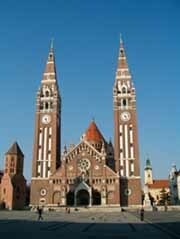 • …Szeged is one of the nicest towns in Hungary and it is worth discovering this beautiful place. There are many different things to do here. For example: relaxing in the Anna Spa, walking in the beautiful old town, visiting the gorgeous cathedral. You can find here the best ice-cream of the country. Just visit downtown Szeged and you cannot miss the best pastry-shop, you just need to follow the crowd. What to Make With Pick salami? I usually make sandwiches from this great salami, but my wife sometimes puts together the so called “Magyaros Pizza – Hungarian Type of Pizza”. If you are interested in the pizza recipe, just visit my Favorite Hungarian recipes page. You won’t be disappointed, because this is the best pizza that I have ever eaten in my life. Cut some slices of bread. Put some butter on the bread. On top of the butter put some thin slices of salami and cheese. It is best if you use two or three different types of cheese. When you are finished assembling the sandwiches, just put them into the oven at 200 Celsius (392 Fahrenheit) for 15-20 minutes. The sandwich is ready when the cheese starts to turn brown.